I have the perfect Strawberry Lemon Spring Cupcakes that are quick and easy to make and so stinkin’ cute topped with a Peep. I wanted a lemon cupcake that was topped with a light, sweet strawberry frosting that Riley and her friends at daycare could enjoy with their Bunny Tail Mix Push Pops. Based on her taste testing tonight, I’m absolutely sure these will go over well at daycare. Thanks so much Claire. They were so easy to make as well, which is always a plus when your 8 months pregnant and have a 3 year old running around. Love these Jenny! 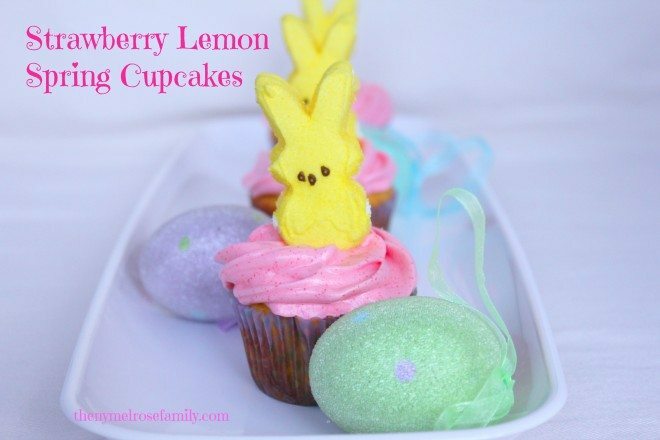 I’m not a fan of peeps, but I AM a huge fan of these cupcakes! Love the color! Thanks so much Tanya! That means a lot coming from you. I’ve always admired your recipes. Thanks so much again! You’re right Jenny! They are stinkin’ cute! What little girl wouldn’t love to show those off to her friends? For that matter, big girls too ;). Aww! Thanks so much Doreen. They were a huge hit. SO CUTE!! You have the cutest Easter stuff, Jenny!! How cute are those cupcakes? They look quite delicious too. I hope you will consider linking it up to the Pinworthy Projects Party over at my blog, Just Us Four. Those look so great, Jenny! The flavor combination sounds delicious and the colors are so pretty! Super cute! I would love if you link this tomorrow morning! My daughter and I made these cupcakes for our church’s Easter Breakfast. They were a big hit. Thank you so much for the recipe! Such a great idea. I’m so glad they worked out Donna. The frosting is kid friendly, but also so light and fluffy that it resembles a meringue. I love strawberry and lemon together, especially in the springtime! These sound so good! These look delish, Jenny! I love lemon and strawberry! Great combo! Jenny, you’re peeps are so cute! Love the strawberry and lemon flavors together. I’m featuring these on my FB page tonight, thanks for sharing at Thursday’s Treasures.